Hamish Erskine, was been inducted at St Mark Anglican Church on Wednesday May 31, 2017 by Bishop Philip Huggins. Hamish has been locum at St Marks for the past 12 months. St Marks Farewells Tanya Cummings. Our Authorised Stipendiary Lay minister (ASLM), Tanya Cummings has completed her year at St Marks and is now undertaking her Curacy at Christ Church Essendon. We wish Tanya well and will miss her at our Sundays services, and thank her for her pastoral care, and support to Playgroup, and monthly worship service at The Ashley Aged Care Residence in Reservoir. safeTALK workshop is aimed at equipping people in the community to recognise and respond to people at risk of suicide; suicide intervention and prevention training. Cost: $40, but don't let cost be a reason not to come – financial assistance is available. Cost includes 3 hour workshop, workbook, and morning tea. In February 2016 David Jones announced to the Parish Council and congregation of St Mark's, Reservoir West, that he are Gretta will be finishing up at St Marks on 20th May 2016. David and Gretta have been at St Marks since February 2008. In the time they have been with us not only have we renovated our buildings, but have also developed new ways of worshipping and sharing our faith such as Church Brunch, All Ages Service, Kids Club, The Vine Group, Alpha, and continued and grown Boys Brigade, and we have an enthusiastic and energized Parish Council. We give thanks for the presence of David and Gretta within Christ's flock here. David and Gretta plan to retire in Melbourne. St Marks student Minister Jonathan and Racheal Lopez, are leaving us to spend a year living and working at Lambeth Palace, London! Melbourne Anglican couple Rachael and Jonathan Lopez will spend a year at Lambeth Palace as part of the Archbishop of Canterbury’s new Community of St Anselm, which will bring together a small group of young Christians from around the world to live in a monastic community of prayer, study and service. The couple, who met as students at Ridley College and attend St Mark’s Reservoir, said that they were excited about the opportunity to learn from and be shaped by the leader of the Anglican Communion, and draw on the wisdom of the monastics. St Marks welcomes Rev Mike Bird, Assistant Curate. Rev Bird was ordained 7 February at St Paul's Cathedral, and will be with us for 2015. The 10:15am services on Sunday November 16th, 2014 will be held in the large hall with a special focus on the children who attend. Dear Lord Jesus, be the guest of our home, and the homes of those we love. Keep far from us trouble and danger, and all deceits of the evil one. The Alpha Course runs for about 14 weeks, each session begins with a DVD talk by Nicky Gumbel, then time for discussion in small groups, where you can ask questions, explore different issues, listen to what others think, and make friends. The Alpha Course explores aspects of the Christian faith and the meaning of life. This years Church camp was held at Upper Plenty Conference Centre, between Wallan and Whittlesea. Guest speakers were Dr Peter and Kathy Downes, of Vineyard Movement, they discussed 'Building Community", through reaching up to God, in to each other and out to others. Meals were hearty country fare, and there was a fire in the hearth, although weather was mild so didn't really need. Gretta lead a Taize style meditation session. 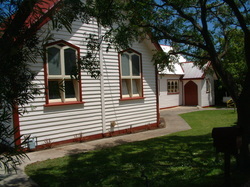 We saw the building works of the new chapel that the Stokes family are constructing from messmate and mudbricks. The children played together, with the dogs, visited the horses, watched a movie, some went for a bushwalk and saw amazing views of the city. In the evening we all joined in trivia night, the grown ups and young people played board games til late. We are all looking forward to next year, as David has booked it again. Jonathan Lopez and Rachael Lopez were commissioned and welcomed to St Marks. Both are studying at Ridley and join us as part of their training for service within the Church. Kids made space biscuits today Monday 13th January. Sunday 15th December at 6pm. There will be a sausage sizzle, live music, and Christmas Carols. At 21 Beatty Street, Reservoir. As part of our Open Day celebrations, resident cook (and keen cake eater) Stephen Eynaud, will be hosting a Cake Baking competition. Bring along your favourite cake to be be judged alongside other entries. A prize for the best cake will be awarded, then the cakes will shared for supper. Cherry picker to put on capping November 2013. We are in the process of updating our Church with a new roof, re-stumping, and repainting. It has been a team effort and we are looking forward to celebrating the completion of works in early December in time for Christmas. This year's theme is Kids in Space and it is going to be week of fun.